On Tuesday, after years of furious debate, Amtrak finally announced plans to build a high-speed railway from Boston to Washington, D.C. The proposed line will make it possible to travel from Beantown to the Big Apple in 86 minutes and from New York to the nation's capital in just over an hour and a half. It will link the East Coast with a futuristic, 220-mile per hour bullet train, employ thousands of people, and generate an estimated $900 million per year. Unfortunately, it will also take a generation to build. The proposal estimates that construction will take 25 years and will be finished by 2040, at a cost of $117 billion. For rail enthusiasts, it is easy to make unflattering comparisons between America's poky rail system and that of almost every other technologically-advanced, industrialized country. But in some ways, this proposed line makes the U.S. look even worse. It's not just China and Germany that are doing better with high-tech rail infrastructure -- and the jobs and higher economic activity that go along with it. The proposed East Coast rail line is put to shame by the efforts of earlier and less-advanced governments, from Teddy Roosevelt's administration to the rule of Tsar Alexander III of Russia. 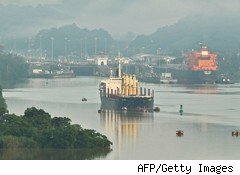 Between 1904 and 1914, U.S. engineers oversaw the construction of the Panama Canal. While the 48-mile long trench is just over one-tenth the distance of the proposed Washington-Boston train line, the canal runs through some of the most treacherous, disease-ridden land in the Western hemisphere. The amount of work involved is astounding: Construction on the canal consumed an estimated 12 million pounds of dynamite per year and displaced enough dirt to build a pyramid over three-quarters of a mile high. In addition to spending millions of dollars and hiring thousands of workers, U.S. President Teddy Roosevelt also had to create a new country: Faced with slow-moving, bureaucratic Colombian negotiators, he supported a Panamanian independence movement which supported the new canal. Even with all this, the Panama canal took only 10 years to build -- a third of the time that it will take the U.S. to connect Boston and Washington. In 1988, after over 150 years of discussion and debate, the United Kingdom and France began construction on the Chunnel, a 31-mile long undersea tunnel connecting Kent, England to Coquelles, France. Actually consisting of three tunnels, the Chunnel is the longest underwater tunnel in the world, and is 250 feet deep at its lowest point. 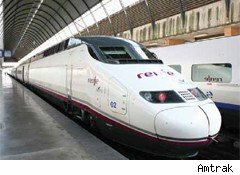 It is used by both passenger and freight trains, and connects high-speed rail lines in the United Kingdom and France. Finished in six years, construction took only 20% of the time allotted for the Boston-to-DC rail line. 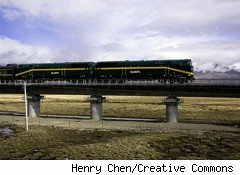 China's controversial railroad from Golmud to Lhasa connects Mongolia to Tibet, effectively drawing in two of the country's more far-flung regions. At 709 miles, the line is 60% longer than Amtrak's proposed route, and was a much tougher build. Unlike the relatively gentle topography of the Northeastern U.S., the Golmud to Lhasa rail covers some of the roughest terrain in the world, including over 340 miles of permafrost. The line runs across Tanggula Pass, the world's highest-altitude rail, and has two of the longest tunnels in the world, as well as 675 bridges. Construction on the line began on June 29, 2001 and finished on Oct. 12, 2005. At four years, three months and fourteen days, it took a little over one ninth the amount of time that Amtrak has allotted for the D.C.-to-Boston route. Connecting Moscow to Vladivostok, the Trans-Siberian railway is the world's longest railroad. At 5,753 miles long, it spans seven time zones and is the primary route across much of Russia. While it is more than 13 times as long as the proposed D.C.-to-Boston line, the Trans-Siberian rail took 22 years to build -- eight years less than Amtrak has proposed for its route. 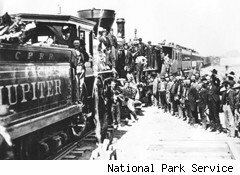 From 1863 to 1869, the Union Pacific and Central Pacific railroads built a line from Council Bluffs, Iowa to San Francisco, California. The new route, which linked to the East Coast's extensive rail infrastructure, ultimately connected the U.S. from coast to coast. Containing 1,777 miles of track, the transcontinental railroad was funded by 30-year bonds issued by the U.S. government, and was helped along by government land grants. Despite covering over four times the distance of the D.C.-to-Boston line, the line took only six years to build. The race to the moon began on Oct. 17, 1957, when the Soviet Union launched Sputnik, a small satellite, into orbit around the earth. Almost immediately, the U.S. government launched the National Advisory Committee on Aeronautics (NACA), the predecessor to NASA. Dating the race to the moon from Sputnik's launch to the July 20, 1969 -- the day Neil Armstrong stepped on the moon -- it took eleven years, nine months and three days, just over a third of the time that Amtrak has budgeted for the D.C.-to-Boston line. In terms of distance, the trip was roughly 238,857 miles -- or about 540 times the distance between Washington and Boston. Of course, there are some important differences between Amtrak's project and these other efforts. After all, Chinese planners don't have to worry about civilian land easements. For that matter, neither did the Russian royal family. Yet the bureaucratic hurdles blocking the Panama canal were easily as difficult as those in the way of the proposed East Coast rail line, while the engineering difficulties of the moon shot dwarf any issues that Amtrak's planners are likely to face. Ultimately, what separates Amtrak's attempt at high speed rail from earlier engineering marvels is a unified, cohesive sense that this project is a priority for the U.S. Unfortunately, amid calls for Amtrak to disband and demands for the privatization of rail travel, national cohesion is one commodity that Amtrak may not be able to rely on.